Quality Seed & Clean Feeders Matter! Wow! These are gorgeous and so practical, too! 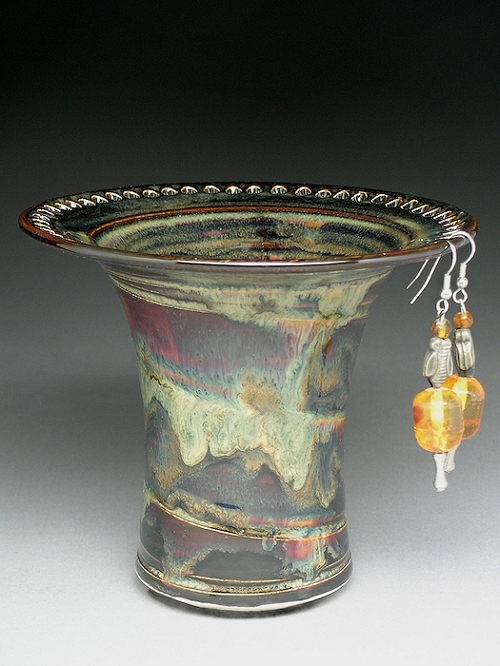 Handmade, wheel thrown earring holders by potter Barb Lund, each has a unique array of color. Psst…Add on a “starter” pair of earrings. Just ask, we can help. but phone calls still work best! Convenient free parking directly behind the store. Our emails are rare birds and fly in as seasonal reminders carrying noteworthy information. We promise their chicks will never hatch in your InBox. And, our mailing list NEVER migrates, so your info stays private. Join The Backyard Naturalist Team! The Backyard Naturalist is Hiring! Pine Siskins Have Been Spotted in Maryland!!! Hummingbirds are on their way!!! Ready for Fall Migration? It is ON! The Backyard Naturalist has gifts for all ages and within any budget. Stocking Best Quality Wild Bird Seed & Suet, Wild Bird Feeders, Squirrel Feeders & Foods, Bird Baths & Fountains, Bird & Bat Houses, Nesting Boxes and Birding Resources for Birders and Nature Lovers in the Greater Washington, DC area. Three time winner 'Best Of Montgomery County' Best Gift Shop, featuring nature-themed gifts for all ages, within every budget.